On March 28, the boat Mugunghwa (‘Rose of Sharon’) No. 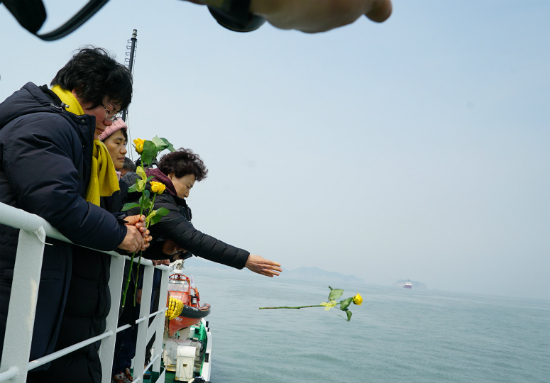 5 halted at a location 200m away from the White Marin, the half-submerged boat bearing the Sewol Ferry, and sounded its horn three times in low, heavy tones. 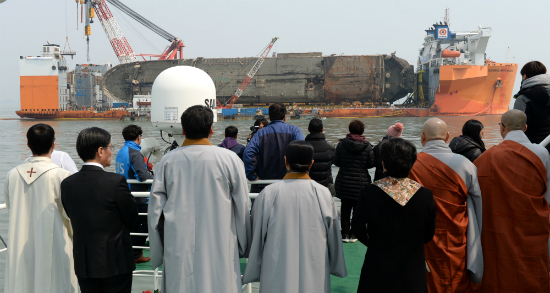 Twelve pastors and priests representing the Protestant and Catholic churches and the Buddhist and Won Buddhist faiths, together with six persons whose family members are still missing from the Sewol Ferry disaster, looked across the water at the Sewol, which has been pulled out of the ocean almost three years after the disaster, and prayed together for the safe recovery of the remains of the nine not yet found. After the prayers, all the participants threw yellow roses into the ocean to express their hopes. The White Marine may leave as early as March 30 for Mokpo New Port, which is 105 km away. The National Council of Churches in Korea and April 16 Sewol Families for Truth and a Safer Society (the bereaved families’ council) will hold a joint Easter service with the theme “Jesus Is Here,” at 4:30 p.m. on Sunday, April 16, in Hwarang Recreation Park, Ansan. Easter Sunday this year coincides with the third anniversary of the disaster.